New Zealand’s Central North Island has a wide range of activities and attractions to suit all ages and tastes. We have developed a number of very special regional scenic helicopter flights which incorporate luxury travel and unique destinations. If these don’t quite suit your particular requirements please let us know and we can develop a helicopter flight itinerary and experience just for you. Prices valid for 2018 but are subject to change. All flights below depart from Hamilton. Please enquire for prices from departing from other locations e.g. Auckland, Taupo, Rotorua, Tauranga. Experience the thrill of a helicopter ride above New Zealand’s largest inland city. Take in the spectacular views of the international award-winning Gardens and the mighty Waikato River. 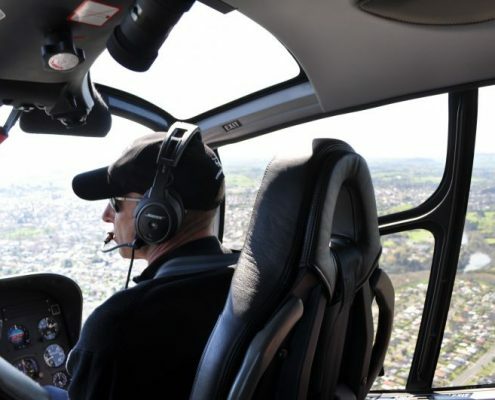 Be amazed by the inspiring Waikato backdrop as you enjoy a comfortable 15-minute scenic flight around the city of Hamilton. Fly over beautiful Waikato countryside to get a bird’s eye view of the Te Uku wind farm and the tallest turbines in New Zealand. See the stunning Bridal Veil Falls; a 55m plunge waterfall surrounded by bush clad hills. Experience an up close flight by Mount Karioi, an extinct volcano, sited on the stunning and rugged West coast. 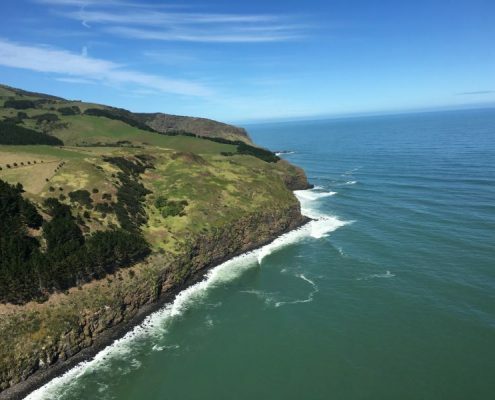 See popular and world famous surfing spots from the air before you fly over the quaint town of Raglan and its extensive inland harbour. Your 40-minute scenic flight ends as you return to Hamilton but your memories will be with you forever. 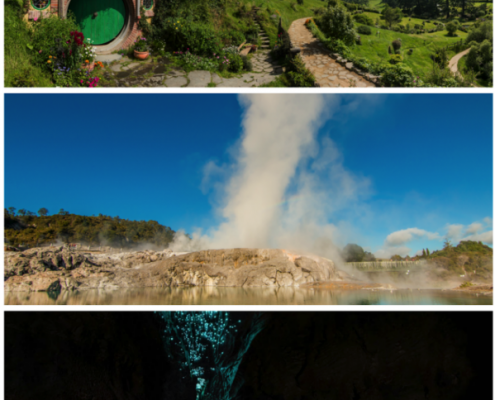 Experience the wondrous and world famous HobbitonTM Movie Set, featured in The Lord of the Rings and The Hobbit films. Your flight will give you spectacular views of the Waikato countryside across to the Kaimai Ranges and then the lush pastures of The Shire. On a guided two-hour tour you can check out the amazing movie set which includes the Green Dragon Inn, the Mill, the Party Tree and many Hobbit Holes including Bag End, where Frodo and Bilbo’s adventures began. Enquire about lunch options available or upgrades for private tours. Combine exhilarating helicopter flights with this unique trilogy to experience some of the best that New Zealand’s North Island has to offer. Travel in style and comfort to the three Trilogy destinations: Hobbiton Movie Set, Te Puia Rotorua, and the Waitomo Glowworm Caves. A perfect day full of adventures and great way to tick off some of Pure New Zealand’s Must Dos. 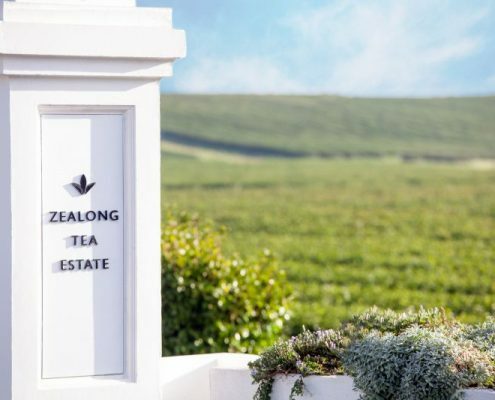 Arrive in style and tour the flourishing Zealong Tea Estate, enjoy a traditional tea ceremony and a luxurious high tea in this elegant setting. Flights from Hamilton include a city scenic tour and flight over the beautiful and international award-winning Hamilton Gardens. Be sure you have your camera ready for this amazing trip! Departing from Hamilton you will fly past Te Uku wind farm with the tallest turbines in New Zealand and over bush clad hills past Bridal Veil Falls; a stunning 55m plunge waterfall. Your flight will take you around Mount Karioi, a 2.4 million-year-old extinct volcano, to the rugged and jaw dropping West coast. 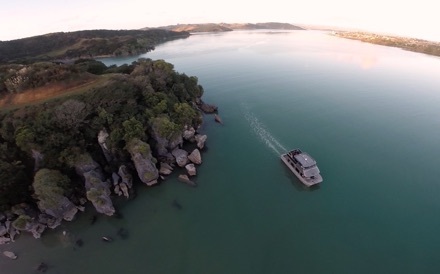 Landing in the coastal town of Raglan you will board a pontoon style catamaran for a one-hour scenic harbour cruise. Enjoy a gourmet nibble platter served while you explore some of Whaingaroa harbour’s spectacular hidden secrets before returning to Hamilton with a scenic Waikato flight. Fancy a spot of lunch while cruising the harbour? Enquire now for upgrading for a gourmet BBQ lunch on the boat! This unique double whammy is a once in a lifetime opportunity for Tolkien fans! Enjoy a scenic helicopter flight over beautiful Waikato countryside to the world famous Hobbiton™ Movie Set. Join a guided two-hour tour visiting Hobbit holes, Bag End, the Green Dragon and many other locations that featured in The Lord of the Rings and The Hobbit Trilogies. 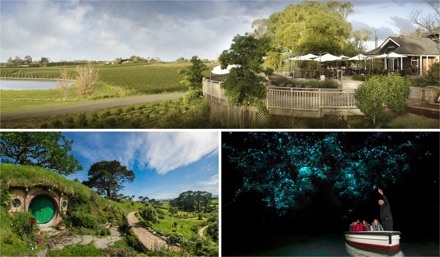 Relax and soak up the Hobbiton atmosphere as you tuck into lunch at The Shires Rest before flying out over rolling green hills and onto the next part of your Middle Earth adventure; a private Hairy Feet Tour at Waitomo’s Denize Bluffs. 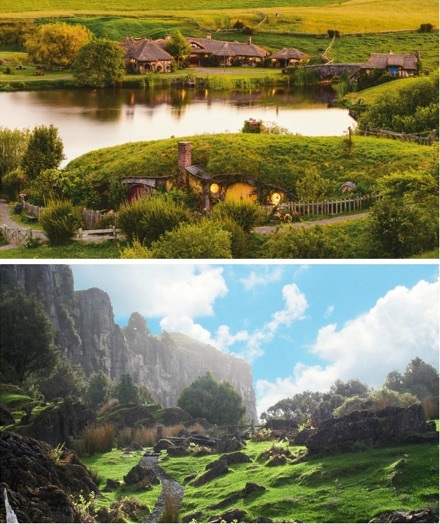 This stunning movie set location was chosen by Peter Jackson for An Unexpected Journey and features towering limestone cliffs, absolutely spectacular scenery and a primeval native forest, Your private tour will take you around this magical valley and your knowledgeable guide will give you plenty of photo opportunities before you take your relaxing flight back to Hamilton. Be delighted and amazed on a scenic helicopter flight to some of the best attractions in New Zealand’s diverse and stunning central North Island. Start the day with a scenic flight to Zealong Tea Estate for a tour and spectacular morning tea. Depart from New Zealand’s only tea plantation for a flight onto the wondrous Hobbiton™ Movie Set for a fun-filled guided tour followed by lunch at The Shires Rest. Sit back and relax for your afternoon flight which will take you to the heart of the spectacular Waitomo region for a walking tour through the majestic Cathedral Cave and a magical boat ride through the Glowworm Grotto. Canapes and bubbles will be served under a canopy of forest and sky, before you board the helicopter for your picturesque return flight. Upgrades are available at each location, please enquire for prices and more details. 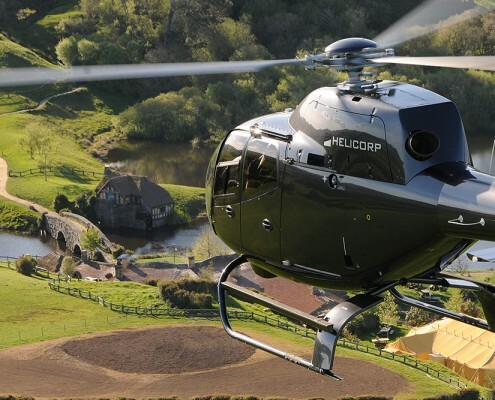 Helicorp specialises in building helicopter experiences that suit our client’s particular wishes and requirements. Or contact us to discuss your preferences. If you’re looking for gift ideas, then find out more about our gift vouchers.